The Paleo diet is a way of eating based on the ancient diet that various human species consumed during the Paleolithic era — the Agricultural Era that began just over 12 thousand years ago, spanning less than five hundred generations and equating to only a fraction of the time that our species has existed. Strong anthropological evidence indicates our ancestors consumed a diet that included meats, fish, seafood, eggs, non-starchy plants, nuts, and fruit. Humans evolved eating this way, and evidence from DNA studies indicates that the human genetic blueprint (or genome) has changed very little in even the past 40,000 years. Hence, proponents contend that our bodies have been genetically coded to maintain the best health on a paleolithic diet. The main idea is that we are not genetically adapted to eat the processed foods invented in modern times, and when we eat these foods, they make us sick. Paleolithic proponents point to the fact that modern human tribes eating traditional diets similar to those of Paleolithic hunter-gatherers are mostly free of modern diseases. 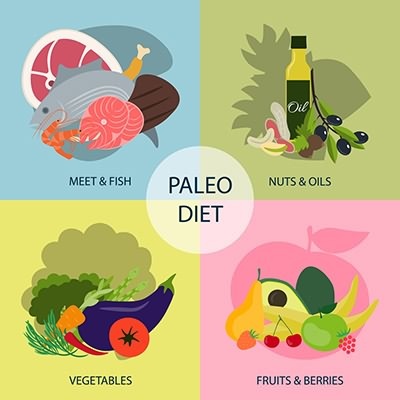 The Paleo diet is simple and straightforward. The Golden Rule is not to eat anything which is not good and as close to its natural state as possible. Any domestic meat and poultry, including organ meats. Beef, pork, lamb, chicken, turkey are good choices, and grass-fed meats and poultry are preferred. Any wild game meats or poultry such as elk, buffalo, boar, quail, duck, goose. Fish and shellfish, preferably wild caught. Seeds such as pumpkin, sesame and sunflower. But Aren’t Whole Grains Good For You? The agricultural revolution, (Neolithic period) during which grain-based foods became part of the human diet, only occurred 10,000 years ago, which is a concise time compared to the fact that the true human species has been walking the earth for more than a million years. There is clear skeletal evidence which shows that once grains were introduced into the diet of modern human populations, bone and teeth structures were weakened, malnutrition became rampant, and infectious diseases developed. Also, a recent analysis updating the picture of relative brain size changes in humans during our evolutionary history has revealed that human brain size has decreased by 11% in the last 35,000 years, with most of the decline happening in the previous 10,000 years. Dairy foods have only been in the human diet for about 7000 years. Some Paleo diet enthusiasts avoid milk because it contains a protein called casein which breaks down in the digestive system to a substance called casomorphin. Casomorphin acts as an opiate substance within the body, and it has been linked to autism in children and as a trigger for the development of diabetes. Milk products are essential for good health. However, if your gut health has already been compromised by eating grains, and your stomach pH has been altered by chronic antacid use, dairy products may aggravate the situation. Normal stomach pH allows for the full function of the enzyme pepsin, which can easily break up milk proteins into smaller amino acids which have no bioactivity. If stomach pH is too high, pepsin cannot work correctly, and the bioactive dairy casomorphines are left intact. Grain-based foods cause gut inflammation, leakage and heartburn, which necessitates the use of antacids, interferes with pepsin, and this starts a cycle of gut problems which the intact milk proteins may aggravate (not cause).